State-of-the-art technology benefits seniors with better-defined apps and devices that address specific challenges that seniors can face when continuing an independent lifestyle. Some can extend the time you can live on your own or optimize your situation with a caregiver. They can also improve your health in a myriad of ways. Devices like Reminder Rosie focus on keeping seniors on a daily schedule with reminders to perform tasks such as taking medication, checking in with loved ones, or anything else that is part of your routine. Because you can customize its operation, you can solve multiple issues with one purchase. Whether you’re a senior living alone or with a caregiver on-site, devices such as Reminder Rosie can provide important reminders for tasks such as medications that are essential for quality of life for aging in place. It simplifies them and offers a solution that saves both of you time and effort. Life Assist Technologies is the brainchild behind Reminder Rosie and its SaaS enterprise platform application for resident care facilities, Circura. The purpose of both products is to find solutions to the challenges of aging in place using a variety of advanced technologies including voice recognition, radio-controlled chips, and software development. Most of the team members including inventor, Gary Rotman, have first-hand experience with personal senior care or senior care industry employment. They work with several advisors in healthcare to incorporate feedback from the frontline into the continued development and refinement of their products. You can rest assured that the operation of Reminder Rosie uses state-of-the-art technology for the optimal user experience. The innovative design of Reminder Rosie has garnered several accolades from a host of organizations, including AARP and New Straights Times which picked it as one of its top gadgets for aging in place. Health Information Resource Center gave the manufacturer its prestigious Bronze award for the Connected Digital Health line of products. Voice technology simplifies the usage of these assistive devices. You needn’t worry about complicated operation once you or your caregiver set them up correctly. The manufacturer has embraced the set-it-and-forget-it methodology for the benefit of those who want to continue with an independent lifestyle. It also allows for hands-free operation with a manual option. Reminder Rosie addresses these concerns directly for a variety of age-related issues. The LED display has a simple font that is large and bright enough to see from a distance at any angle. You can set the alarm to the tone you prefer and it’s loud enough for someone to hear from up to 100 feet away. While it requires electricity, you don’t have to have internet access to use it. You can set up multiple personalized reminders for a myriad of purposes. They playback as verbal directions that a caregiver or loved one can record for you so that you can enjoy the sound of familiar voices. It is a welcome feature for those who live alone. You can also use a few commands such as “What time is it?” after saying its trigger phrase, “Hello Reminder Rosie.” While it can record in any language, it only understands English as of this writing. The package includes a card that lists the ones for which it is programmed. Reminder Rosie has a limit of 25 reminders. Therefore, it’s essential to discuss with your family and caregiver which ones are the most crucial to get the best value out of this product. Of course, medications top the list for optimal health. However, the benefits of receiving these alerts go well beyond the timer. The alarm will continue to sound for up to 30 minutes after it goes off until you say “Reminder off” or press the button on the top of the device. Therein lies another benefit if you have a caregiver. A red indicator light goes off if you don’t turn off the alarm. They can then go back to find out which ones you missed to keep you on schedule with the things you need to do. If you live alone, you can also play them back so that you can keep or delete them on your own by pressing the button or using the trigger phrase again. You won’t have to worry again about missing an appointment or forgetting to take your medication. Reminder Rosie will see to it. The size is compact at only 8 inches long. It’s light enough for you to pick it up and bring the microphone closer to you. It runs on electricity with a battery backup using three AAA batteries. It isn’t crucial to the operation of the device to use them, but we recommend taking advantage of this feature. You can set the date and time by voice or manually. Just speak the command, “Set date,” after waking the device. Reminder Rosie will guide you through the process for each one. Creating reminders is just as quick. The package provides a list of examples so that you, your caregivers, and loved ones can set the appropriate ones for your independent lifestyle. Wake the device and say “Record reminder” within an arm’s length of the unit. Speak loud and clear for up to six seconds per reminder or alarm. You can review them to ensure that they’re correct by saying “Play all reminders.” You can also get the same feedback while in Manual Mode. You can erase them and start over too. The manufacturer suggests setting up other types of voice playback that aren’t related to essential tasks. Your grandkids can record a good-morning greeting for you to start each day off on a positive note. And who wouldn’t want to be reminded in the middle of the afternoon that someone special loves you? This feature makes the Reminder Rosie stand out from other smart speakers like Amazon’s Alexa-enabled product line which lack this function. The personalized touch makes this device invaluable for seniors who live alone while aging in place. Reminder Rosie also offers other health benefits. You can use it to remind you to exercise. The Office of Disease Prevention and Health Promotion recommends that seniors get at least 150 minutes of physical activity each week. It can help improve your quality of life while aging in place if you have a chronic medical condition and can slow age-related muscle loss. You can set the device to prompt you to get up every hour and take a walk in your neighborhood. It can help you remember to engage in other activities such as strength training to increase your mobility and allow you to live independently longer. You can also use it to keep you mentally healthy with reminders to call your loved ones on a regular basis. Reminder Rosie is more expensive than comparable products. However, its value is in the peace of mind it provides. And the set-it-and-forget-it technology is priceless too. We suggest buying the latest generation of the item to make sure you’ll get all the benefits of any innovations the manufacturer has made. Reminder Rosie is not without its quirks not unlike similar products like Google Home and Echo Dot. It’ll take some time to get used to it. There are a few issues that you should know about up front. Sometimes, the device may respond to background noise from your TV or conversation inadvertently. It’s part of the challenge of creating something that is sensitive enough to pick up your voice and but also able to filter out irrelevant sounds. If it happens to you, just say “Cancel,” and it will stop immediately. For a permanent solution, you can disable the trigger phrase. The device will work as usual with all of your set alarms and reminders. And if you decide that you’d like to use the voice commands again, you can re-enable it. An indicator light on the front will light up if it is active. Some individuals may have trouble with Reminder Rosie understanding them. Certain words are problematic which the included user manual spells out for you. Remember to speak slowly and in direct line with the microphone on the front of the device for the best results. The unit allows you to set a regular wake-up time, not unlike a standard alarm clock. However, it only has three choices for the tone or the device’s voice. If you need to snooze a time or two, you can set additional reminders to nudge you awake for the day. The advantages of Reminder Rosie extend beyond that of the senior living independently. They also provide peace of mind for your caregiver and loved ones. The device automates the process of reminding you about essential tasks to ensure you complete them. It gives feedback about compliance to keep you on schedule if you miss a reminder. Loved ones have the assurance of knowing that you’ll stick to your routine even if there is a power outage. The battery backup will ensure that the date and time don’t change, and the data for your reminders are stored within the memory chip, another example of the unit’s robust technology and the manufacturer’s attention to detail. Reminder Rosie offers an excellent way to maintain your independent lifestyle by ensuring that you continue with your healthcare routine. It can also improve your quality of life with voice recordings of loved ones to give you the comfort of feeling in touch with them even if you live alone. That feature makes it a better option if you’re in the market for a smart speaker. You can also use the device to improve your physical and mental health with reminders to stay active and connect with friends and family. It may even allow you to age in place longer with a virtual assistant to keep you accountable and on track with essential tasks. The number of alarms and reminders is generous to allow you to plan your entire day. You can set recurring tasks or one-time appointments within its 25-count limit. Finally, using the device is easy right out of the box with clear instructions. Just plug it into an outlet in the room you use most. Reminder Rosie is on the job and ready to support your aging in place. 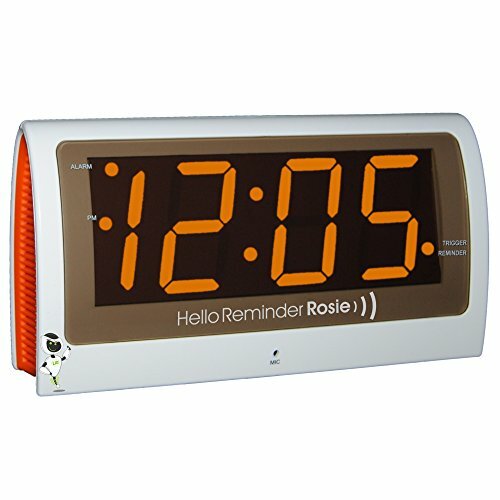 Disguised as a large faced digital clock, Reminder Rosie provides a convenient way to help seniors stick to their daily routine with customized reminders. It is easy to set up using voice commands to simplify the process. It even has a battery backup to ensure continuous operation in case of a power outage.